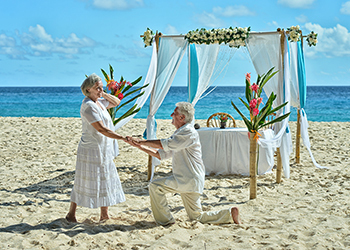 If you are celebrating a special anniversary, or have overcome a difficult time in your lives together, you may wish to renew your marriage vows in front of those closest to you. You may want to say again those promises you made at your original marriage. You might want to include new vows which make reference to your children. You might want to thank your partner for standing by you. You may want to openly declare your continued love and admiration for your spouse. A renewal of vows doesn’t have to be a large affair. It can be a more intimate ceremony if you prefer. Renewing those vows you made to each is a very moving occasion, however you choose to celebrate it. The wording of the service very much depends on what you want to say to each other in front of your witnesses. You can include readings, music, reference to the original ceremony, a pause to remember those who are no longer there to celebrate with you or a symbolic act like a dove release to illustrate your continued love. The content is completely free flowing, so can be formal or informal. It is a lovely ceremony which reflects your personalities and the development of your love story. A renewal of vows doesn’t have to be a large affair. It can be a more intimate ceremony if you prefer. Renewing those vows you made to each other is a very moving occasion, however you choose to celebrate it. READY TO START PLANNING YOUR RENEWAL CEREMONY? I offer three packages for vow renewal ceremonies. I am happy to chat through these with you when we meet up. I can also source invitations, commemorative candles, balloons, ring cushions, guest books and other items to help you with your event. Prices for these are available upon request. This is a lovely romantic service (about 30 minutes) with time to really personalise your ceremony through the telling of your love story and to celebrate your union by the signing of a marriage or vow renewal celebration certificate. This is a truly romantic service (about 45 minutes) with plenty of time to make the ceremony really unique; celebrating your vows in style, with the option to include a symbolic act to illustrate your rejoining in marriage or vow renewal. Your love story is also told as part of the ceremony and to commemorate the day with the signing of a marriage or vow renewal celebration certificate.